A shark birthday party is actually a really great theme for kids because it’s got sea life fun with a dash of excitement and danger! 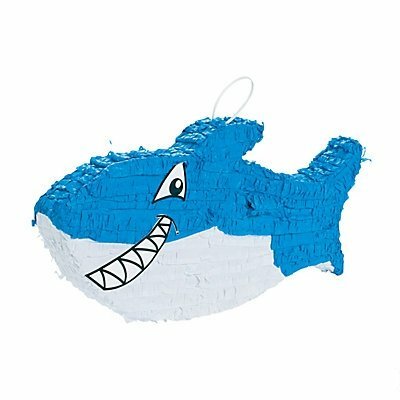 One caution is that a lot of party goods and ideas are geared towards Shark Week and therefore a bit scary for the younger crowd. This party planning guide is chock full of shark birthday party ideas for kids! Our oldest son has been choosing his own birthday theme for the past three years. For his fifth birthday, he threw me a curve ball by chosing… SHARKS! I immediately added all the shark birthday party ideas I could find to my Pinterest Birthday Parties board! Review products were sent for the purpose of this post. All opinions are my own. 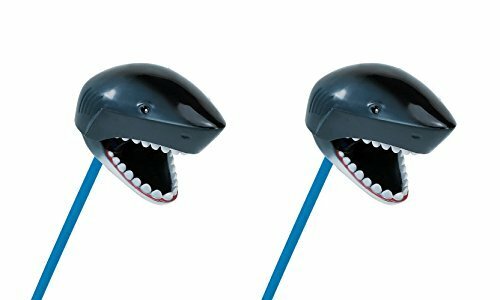 After some searching, I finally found a complete set of shark party decor supplies at Oriental Trading. 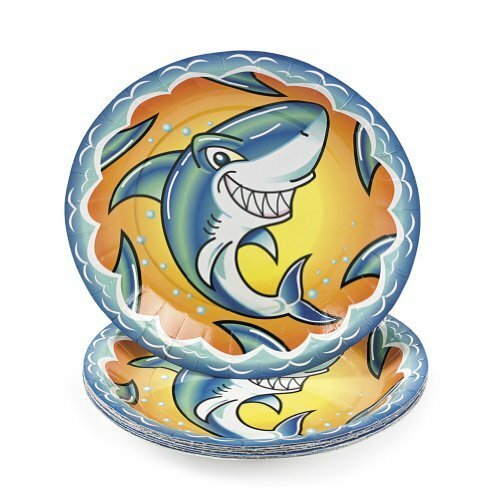 A smiling and not-too-scary shark on cups, napkins, plates, hanging decorations and a table centerpiece! It’s a huge relief to know that no matter what happens in the party prep, I had all the basics covered and ready to go! For interactive play, the Shark snapper toy from Safari Ltd. made the rounds of all the kids (and adults!). We hung the cardboard shark photo prop from our Learning Tower for the kids to play with, which made us all laugh! (I made the boys shark tees and pajama pants too!!). Of course, you know I can’t let a birthday party go by without a little DIY project, so I did have to make a few things! One of the hardest parts about decorating our dining area is that we have red walls, so most party colors don’t blend in well. However, this year I spread a silver plastic tablecloth against the wall and decorated over it, which improved the look. I taped twenty-two streamers to the wall and twisted them for an ocean waves effect. We saved money and did without the helium tank this year. 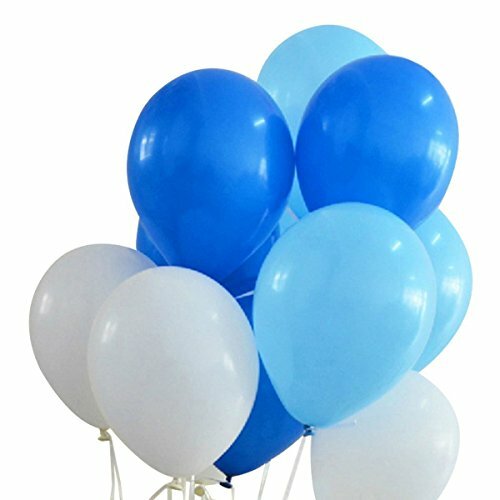 I just blew up the balloons and tied them one after the other on a long length of curling ribbon. Suspending them from the wall created an oceany “bubble” effect across the ceiling. Finally, I strung a shark photo garland across the waves. I love the effect! It’s my favorite party decor to date! I’m definitely leaving it up for awhile. Plus I love looking at the photos of our son! I had this idea for a birthday photo garland using pictures from each of my little boy’s five years. Be forewarned, the danger of this type of project is you’ll cry a lot! After I was done with the crying, I traced a bunch of sharks onto various shades of blue cardstock and cut them out. I cut the photos into circles and glued them onto the shark. I taped the sharks to the thread, which worked just fine, although maybe next time I would punch a little hole and string them on. Appetizers: Shrimp (because, yeah), veggies & dip (sea cucumbers and crab legs with an octopus pepper! Loved making that! ), fish and chips (blue corn chips make awesome shark fins!). Dinner: Submarine sandwiches (ordered from the deli! ), Macaroni & cheese (coral reef), and salad. Beverage: Squid Ink Punch (grape juice, lemonade, and Sprite or seltzer) – it was a huge hit! Plus water (fresh, not salt!). Dessert tables have been a huge hit at parties for many years now. However, they can be sugar heavy, so we wanted to keep it simple. Instead of bowls of candy, we opted to tuck a few candies in with some healthier snacks. 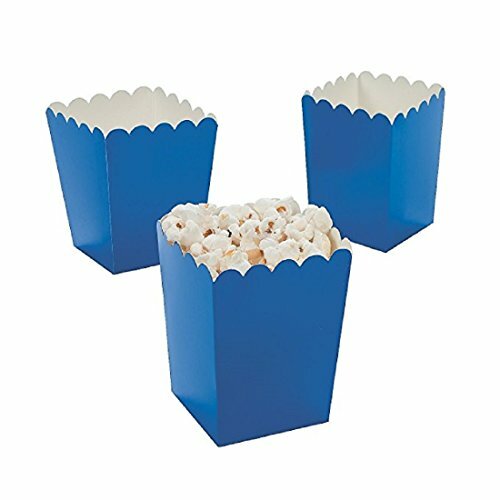 I filled mini popcorn boxes with “shark bait” party mix with popcorn (sea foam), pretzels (driftwood), peanut butter crackers (sand dollars), and mini marshmallows (sea sponges). Then on top, some Surf Sweets peach and watermelon gummi rings (life preservers), jelly beans (shark eggs, yes some sharks lay eggs), and gummi worms (eels). These party mix boxes were a huge hit and chomped down quickly! For the food signs, I just designed my own with picmonkey and printed them out on cardstock. Then I used my Stampin’ Up flower circle punch to make the “bite” in the corner of each sign! 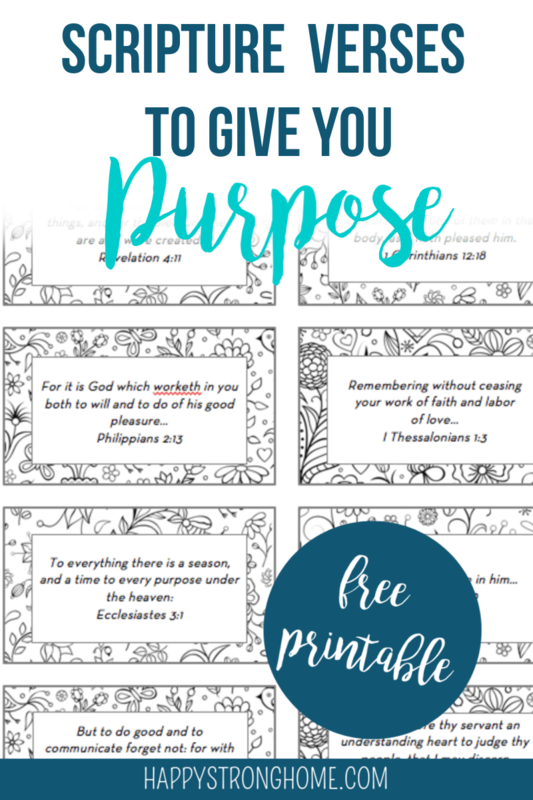 Leave a comment below to ask for the printable and I’ll email it to you. One of these days I’ll get around to uploading it here to click and print. The shark cake was probably my hardest challenge. I had to make it full of sharks, but not scary! Fortunately, I got to work with Safari Ltd. again this year. 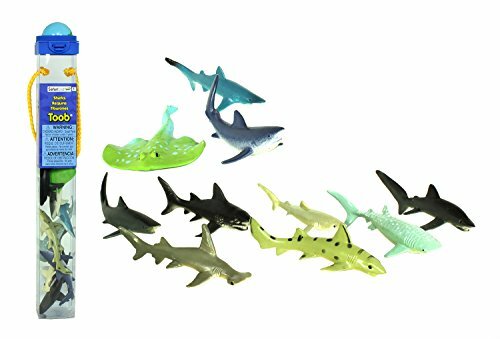 Their hand-painted, realistic animal figurines are the perfect shark party accessory for cake toppers, cupcakes, party favors and games! Using Safari Ltd’s TOOBs of mini shark figurines, our oceanic cake swam with an awesome variety of sharks! I placed a large Great White Shark splashing down into the cake. And the shark snapper toy (pictured above!) made his way around the dessert table chomping on everything. Safari Ltd. large shark figurines were great for decorating dishes and tabletops…unfortunately, the trouble with using cool toys as decorations for a kid party is…. They often get shark-nabbed! Surf Sweets candies swam in the shark bait mix and cake decor. Gummi rings and gummi bears became swimmers on inflatable tubes! Gummi worms and jelly beans marked off the “safe waters,” and my son was so taken by the “diver below” buoy made of jelly beans, that he chose that corner as his birthday slice! What I love about Surf Sweets is they make organic candy using only natural fruit juice as a sweetener. There’s no artificial colors, flavors, or any of the top 10 allergens in their candies! Plus, you get Vitamin C. There’s no food dyes, because Surf Sweets uses plant-based colorings! Surf Sweets gummis have a fresh fruit flavor, and are chewy with soft texture and perfect sweetness. Yum! Their snack packs are perfect for party favors too! Overall, this has been my favorite birthday party yet! The excitement on my son’s face when he came down in the morning to see all the sharks and ocean decor made my day! Thanks to Oriental Trading, Safari Ltd., and Surf Sweets for providing samples that helped make our son’s birthday party amazing! All opinions are my own. Love all of this! Can I please get the printable items, like the food tents? Thank you so much! Can I have the food tents as well? So cute!! How can I get the printable? would really appreciate it! Great ideas! Would you be willing to share your food table printable? Do you mind sharing the labels….love these party ideas!!! Would love the templates! Thanks! Hi! My five year old LOVES sharks and wants a shark birthday party. Your ideas are soooo cute but I was wondering if you’d possibly share your shark garland template and where you purchased the shark backdrop for the table. Great party and thank you! Doing a shark themed party for my one year old! Love your stuff! Would you mind sharing your food name card template? Please email if you don’t mind!! I love it! CUTE t-shirts and pj pants! Julie, I love the photo garland.